DIY tuning springs - wire diameter? Hi - ive been learning to make springs lately and im interested in making tine springs for a rhodes. I dont have any springs on hand, so im wondering if anyone knows what diameter(s?) the wire(s?) 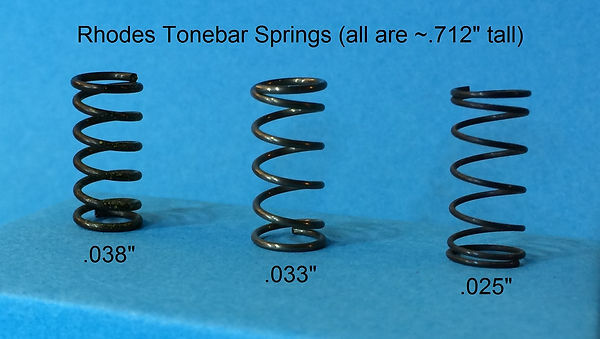 that constitute the different sized springs are? Im not using the idea for rhodes pianos, im just making experimental instruments, and thought you guys would know best. Thanks. Re: DIY tuning springs - wire diameter? Here is a photo of some Rhodes tuning springs. The springs with three windings on either side of the bend and the springs with five windings on either side of the bend are made with the same diameter wire. It measures about .031 inches in diameter. In all of my Rhodes pianos, there are tuning springs with three windings, four windings, and five windings on either side of the bend. I didn't have any 4-4 springs to pose for the picture above, so I just left an obvious space where they should have been. The big ones on the far right are huge, and made with .050" wire. I have never seen one of this size installed in a piano, but I have only owned 73-key Rhodes pianos. The inside diameter of the tuning springs measures about .065", and fits loosely around the tines which have a diameter of about .059" to .062". The spring doesn't hold tight until it is pushed onto the tine past the bend in the center of the tuning spring. This is the only three different thicknesses that I have in stock. There may exist more variations. My Mark I and Mark II pianos have only these three thicknesses. The figure shown below the spring is the wire diameter. All three springs seem to have been wound around a .250" diameter rod. 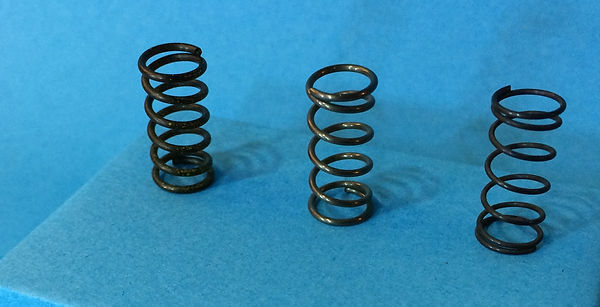 The springs when relaxed to full length seem to have an inside diameter of .245", but when compressed, the inside diameter is larger. The springs are all about .712" tall when uncompressed. 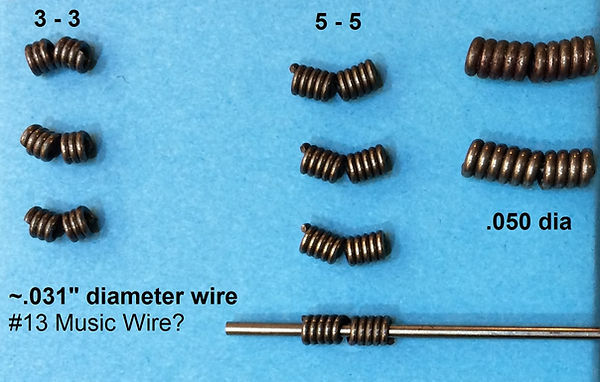 Note that the .038" wire spring has six and a third windings. 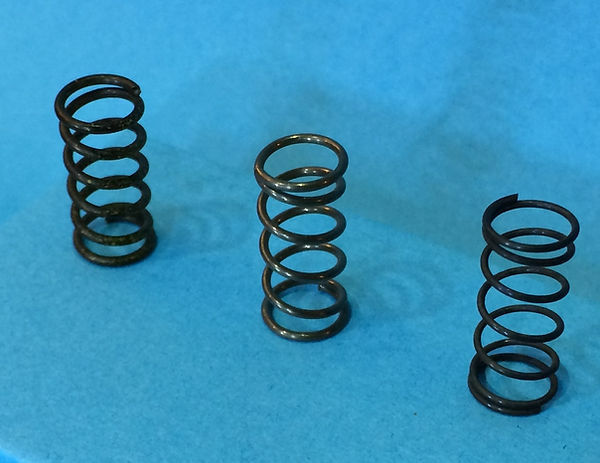 The .033" wire spring has five and a half windings. The .025" wire spring has six and a half windings. In my 1981 Mark II piano, the uppermost springs around the front screw appear to be the same .025" diameter wire, but they seem to have only four or four and a half windings. I didn't pop open my Mark V to check if there are thinner ones, but I seem to remember or imagine that there were some really thin and soft springs on the Mark V (even though the upper ten notes don't even have springs, they have the rubber standoff). The plastic-key 1983 Mark II Suitcase Piano top that I have has only the three spring sizes shown above (and the rubber standoff). I would love to see the method used to wind the springs and the final result. Keep us posted. Wow, exactly what i needed! Thank you, from a sean to a sean...ive actually been stalking this forum for awhile and me and you definitely think similarly. I like the diy spirit.